Whether you are looking for a healthy meal, the perfect side for grilled food or an array of dishes to share, you'll find the recipe you need here. Making use of more unusual ingredients can add real depth of flavour to simple salads. These easy-to-prepare recipes take their inspiration from around the world and are guaranteed to excite your tastebuds. Try nutritious salads packed with grains and pulses such as Herb, Red Onion and Quinoa Salad with Preserved Lemon or Green Bean or Chickpea Salad with Sesame Dressing. Ideas for substantial salads with meat, poultry and fish include Salad Nicoise with Fresh Tuna; Chicken, Courgette and Bulghur Salad with Pomegranate Vinaigrette; and Twice-marinated Beef, Asparagus and Pepper Salad. Protein-rich veggie options with nuts and cheese include Roasted Sweet Potato and Macadamia Nut Salad or Iceberg, Blue Cheese and Date Salad with Saffron and Walnut Dressing. Even the lunchbox pasta salad is reinvented - try Pea, Prosciutto and Fusilli Salad or Rice Noodle, Carrot and Cabbage Salad with Chinese Five-spice Dressing. Fresh and fruity ideas include Melon, Cos and Cucumber with Orange Chipotle Vinaigrette and Green Apple and Wheat Salad with Cider Mayonnaise. 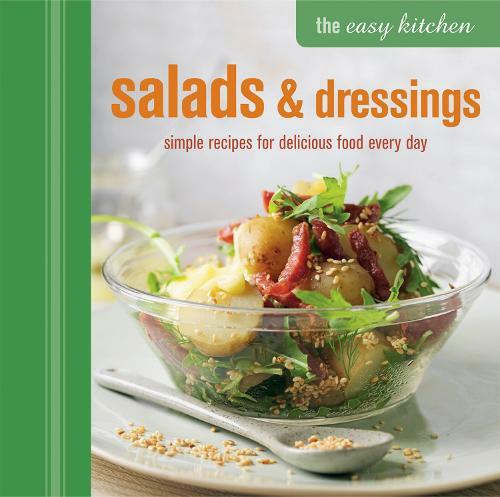 Quick-fix salad dressings, from a classic Vinaigrette to Japanese Soy and Wasabi Dressing, are also included, creating a recipe collection that will be an endless source of salad inspiration.